In contrast to the cast of characters that joined the apocalyptic party thrown by Damon Albarn and his cartoon crew on last year’s multiple-GRAMMY-nominated HUMANZ , The Now Now sees the band largely eschewing guest stars, taking it back to the core Gorillaz crew: blue-haired, sweet-natured dreamer 2D on vocals; whip-smart Japanese badassNoodle on guitar; Brooklyn-born philosopher and the meat–behind-the-beat Russel Hobbs on drums. And with Murdoc Niccals temporarily indisposed, bass duties on the new album have been taken up by erstwhile Gangreen Gang member Ace (explaining the “FREE MURDOC” signage that’s been popping up everywhere from Coachella to the Kentucky Derby to Change.org and Reddit). 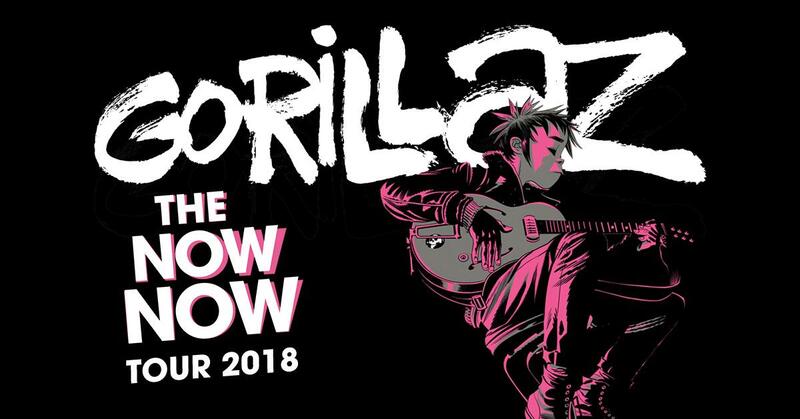 Gorillaz also announced they will bring The Now Now Tour to North America this fall, produced by Live Nation, and culminating in the U.S. debut of Gorillaz’ own acclaimed Demon Dayz Festival. The “joyful apocalypse… and carnivalesque festival of great performances” (The Guardian)” curated by Damon Albarn and Jamie Hewlett, promoted and produced by Live Nation – will make its exclusive appearance for this year at the Pico Rivera Sports Arena & Grounds in Los Angeles on October 20th, just 10 minutes from downtown L.A..
See below for The Now Now Tour itinerary which will kick off October 8 in Toronto, ON and make stops in Montreal, Philadelphia, New York, Boston and Chicago. The Internet will support on all headline dates, with Little Dragon joining as special guest for the Boston show. Tickets for all dates will go on sale to the general public beginning Friday, June 8th at 10am PST at Ticketmaster.com. American Express® Card Members can purchase tickets before the general public in the U.S., beginning Friday, June 1 at 10am local through Thursday, June 7 at 10pm local and in Canada, beginning Monday, June 4 at 12pm local through Thursday, June 7 at 12pm local. The Now Now is available as a single CD, vinyl, at all global digital partners, and as a collector’s edition Deluxe Vinyl LP Box Set at http://gorill.az/thenownow. Virtual group Gorillaz is singer 2D, bassist Murdoc Niccals, guitarist Noodle and drummer Russel Hobbs. Created by Damon Albarn and Jamie Hewlett, their acclaimed eponymous debut album was released in 2001. The BRIT and Grammy Award winning band’s subsequent albums are Demon Days (2005), Plastic Beach (2010), The Fall (2011) and Humanz (2017). A truly global phenomenon, Gorillaz have topped charts around the world and toured the globe from San Diego to Syria, picking up hundreds of millions of streams and record sales along the way. Gorillaz have achieved success in entirely ground-breaking ways, winning numerous awards including the coveted Jim Henson Creativity Honor and are recognised by The Guinness Book Of World Records as the planet’s Most Successful Virtual Act. Labels: Damon Albarn, Gorillaz, The Demon Dayz L.A. It's never too early to begin thinking about 2019, especially when it comes to Coachella! Advance passes go on sale beginning this Friday, June 1st at 11 AM PDT, while supplies last. This will be the only opportunity to take advantage of the Coachella Payment Plan. The price you see is what you pay — prices reflect all fees included. 3-Day GA, 3-Day VIP, Car/Tent Camping, Any Line Shuttle Passes, Hotel Packages and more will be available for purchase during the Advance Sale. 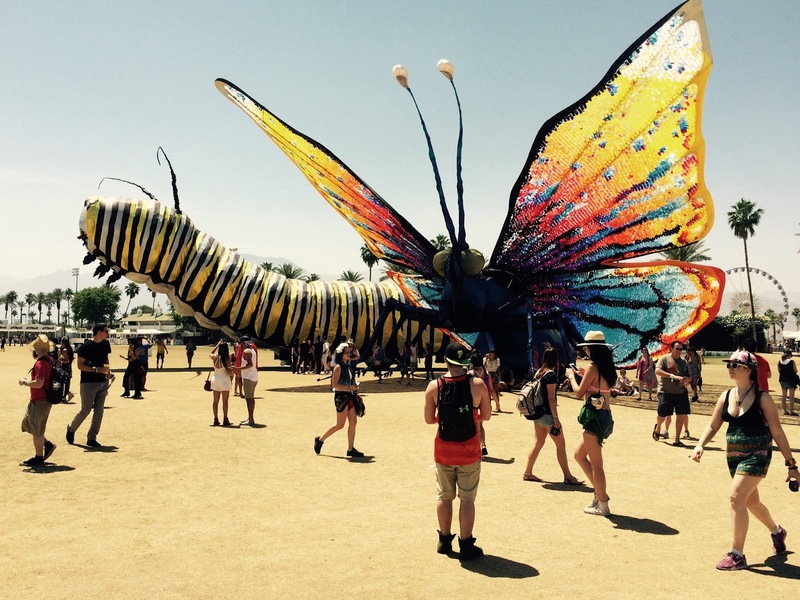 Visit www.coachella.com for additional info. It's great to hear the world is going to see the release of a special, expanded edition of the debut from the Lords of the New Church! Two-CD release from Blixa Sounds, due July 20, 2018, features the band's self-titled 1982 debut plus bonus tracks and a live set! LOS ANGELES, Calif. — The 1982 self-titled debut by post-punk supergroup the Lords of the New Church will be unearthed for a new generation of fans by Blixa Sounds Records on July 20, 2018. 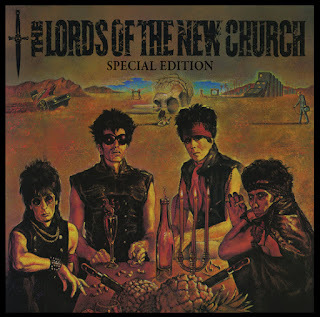 This special edition two-CD set titled Lords of the New Church: Special Edition features all 10 tracks from the band’s 1982 self-titled debut, originally released by I.R.S. Records in the U.S., plus the B-side bonus tracks “Girls Girls Girls” and “Young Don’t Cry,” as well as the single version of the band’s modern rock hit, “Open Your Eyes.” The album is augmented by a 13-track 1982 live set — culled from the band’s own vault — featuring the Lords in all their glory at My Father’s Place, the legendary Long Island, N.Y. nightclub. Aside from live versions of the songs on their debut, the second disc includes the Lords’ reading of the Allen Toussaint classic “Fortune Teller.” The set includes a 12-page, full-color booklet, featuring photos of the band, replicas of gig posters and new liners noted by music journalist Craig Rosen, who interviewed the band in 1983 for his college newspaper. 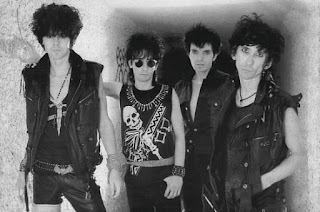 The Lords of the New Church were formed in 1980 by Stiv Bator and Brian James, both survivors of the punk wars of the late ’70s. James was a founding member and chief songwriter of U.K. punksthe Damned, responsible for such classics as “New Rose” and “Neat Neat Neat.” Bator was the mouthpiece of young, loud and snotty Cleveland punks the Dead Boys, known for such classics as “Sonic Reducer” and “Caught With the Meat in Your Mouth.” It was record mogul Miles Copeland, founder of the I.R.S. Records label and older brother of Police drummer Stewart, who suggested the Bator-James alliance. Initially, the Lords were a punk supergroup of sorts, with its first rhythm section consisting of ex-Generation X bassist Tony James and two-time Clash drummer Terry Chimes. Though they didn’t last, their song “Russian Roulette” stayed, and made the band’s debut album. Bassist Dave Tregunna of Sham 69 was eventually recruited with Damned drummer Rat Scabies joining the fold for a single 1980 gig billed as the Dead Damned Sham Band. By the time Scabies was replaced by Nick Turner, formerly of London-based neo-surf combo the Barracudas, the band was rechristened the Lords of the New Church. Recorded at Farmyard Studios in the U.K. and produced by the Lords, the band’s 10-track 1982 debut is an unholy mix of punk, glam, garage rock and goth, giving those too young to catch the Damned and the Dead Boys in their prime the opportunity to experience the legends of Bator and James in real time. Delivered at the beginning of the Reagan-Thatcher years, Bator’s lyrics perfectly caught the paranoia of the time, observing, “They threaten our lives with nuclear war” in the opening salvo “New Church.” He takes it a step further in the band’s biggest hit and album standout “Open Your Eyes.” Over a galloping punky reggae rhythm provided by James et al., Bator sings, “Video games train the kids for war / Army chic in high-fashion stores,” later adding “nuclear politicians’ picture show / the acting’s lousy but the blind don’t know.” Those lyrics were timely in ’82, and sadly they’re still relevant today; only the puppetheads in charge have changed. Stiv may be gone, but it’s not too late for you to worship at the altar of the Lords and join the New Church. Shut up and sit down, and give it a listen. 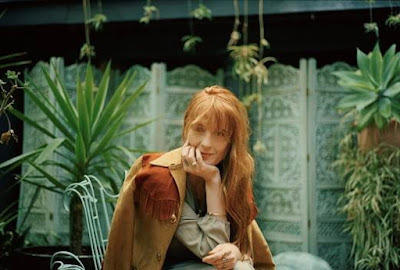 NEW YORK, NY (May 29, 2018) – Florence + the Machine confirm a 23 city North American fall headline tour today, kicking off August 5 in Montreal, QC and including stops at Los Angeles’ Hollywood Bowl and New York’s Barclays Center. Further dates include Seattle, Portland, Nashville, Washington, D.C., Philadelphia, Chicago and more. A wide range of talented artists are truly in their element using their roots in carving out great new recordings available now. 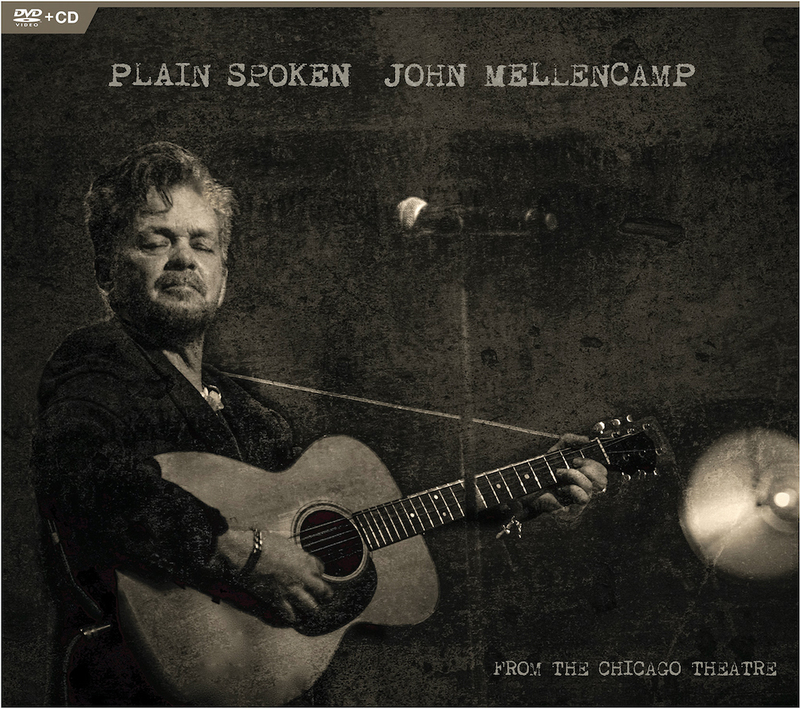 Tell me more: In Plain Spoken: From The Chicago Theatre singer-songwriter John Mellencamp provides a deeper look into his craft via a mix of stunning musical performances and spoken word. In the digital release I reviewed, there was both a full-length concert film featuring Mellencamp and his terrific band, as well as that same concert film featuring a voice over from the artist offering a wealth of insights about the beginning of his career, his ability to observe and put those observations into song, and thoughts about the world about him. The performances range from the blues-flavored "Lawless Times" and Americana-draped "Troubled Man" to rocking takes of "Rain on the Scarecrow" and "Pink Houses." The work of fiddler Miriam Sturm and accordion player Troye Kinnett in particular enhances the performances. But it is the narration that will appeal to those looking for a deeper glimpse into the Rock and Roll Hall of Famer. "I've always been interested in other people," Mellencamp acknowledges early in the film. "And at the same time always found other people in my way." Plain Spoken: From The Chicago Theatre is available on DVD+CD, Blu-ray+CD and via digital formats. Information: www.eagle-rock.com. Tell me more: Five years after teaming up for their Grammy-winning masterwork Get Up! 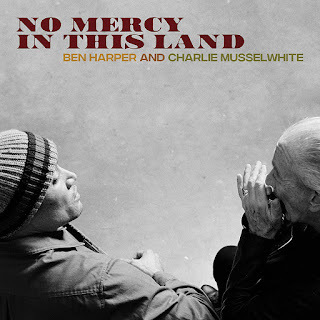 Ben Harper (vocals, slide guitar, piano) and Charlie Musselwhite (harmonica, vocals) have joined forces again (Get Up! was one of my favorite albums of 2013. View my review of the album here). No Mercy In This Land finds the dynamic duo once again demonstrating there is plenty of new territory to explore in the blues. This is an album that explores the genre's richest traditions even as the approach here has a contemporary energy and relevance that astounds. The fleet "Bad Habits" finds Harper even tapping into a seemingly authentic early 20th century poetry while conjuring up the blues: "When a man gives you his hat / He's living on borrowed time." Musselwhite's potent blues harmonica spices up the track, as well as the original material across the disc (just listen to "Movin' On" later). The fiery Chicago blues "The Bottle Wins Again," yearning ballad "When Love Is Not Enough" and country blues "Trust You To Dig My Grave" demonstrate the range of the duo's approach. Musselwhite takes over lead vocal duties on the descriptive Delta foray "No Mercy In This Land," a Harper-penned tale whose probing lyrics could have been penned in the 1860s or 1960s and sound just as timely in 2018. Information: BenHarper.com. Dana Point, CA on May 19, 2018. 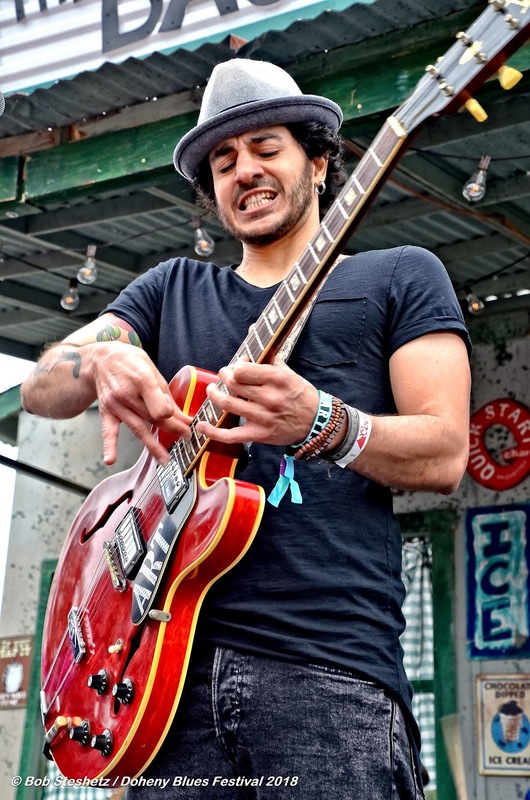 Tell me more: Armed with a powerful and soulful voice as well as top-tier talent on lead guitar, Brazil-born Artur Menezes shines across his new Josh Smith-produced album Keep Pushing. The 10 original songs are outstanding, and what's more Menezes is expert at mixing up a number of styles. For example on the heavy blues-rocker "Come With Me" his approach recalls a mix of vintage Bad Company and modern-day heroes Black Country Communion. 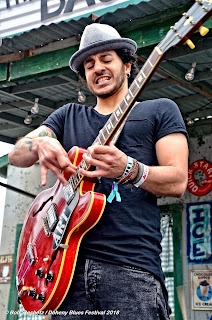 He turns on a dime for the Texas blues of "Any Day, Anytime," here his voice equal parts Austin gale and Memphis soul. On the rockabilly-tinged "Love'n'Roll," he dips back into the sounds of the '50s for a spirited romp where his pleasing vocals and guitar work are positioned amidst horns. The lovely "Can't Get You Out Of My Mind" is a ballad that fuses jazz chords into the blues sound, while the spirit of Hendrix creeps into the psychedelic blues rocker "Til The Day I Die." "Pull It Through" simply thrills with its power and style. Sure, Menezes' guitar work is thrilling; but just listen because his expressive solos always come in the service of the songs themselves. Information: www.arturmenezes.com. 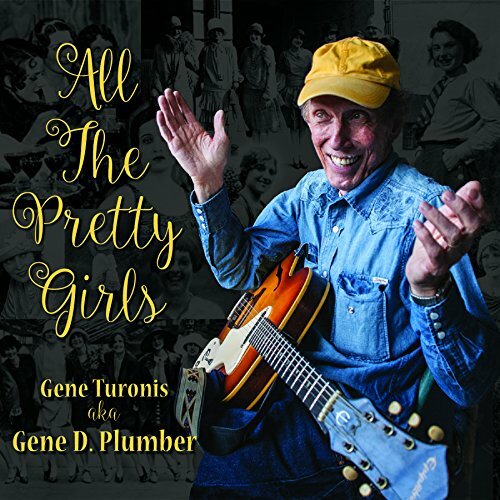 Tell me more: There is a sense of bona fide fun while listening to Gene D. Plumber's All the Pretty Girls. Not many artists release a commercial debut album at age 72, but Plumber provides aspiring recording artists and roots music fans of all stripes a joyful listen thanks to a great collection mixing up his colorful originals and reworked covers that benefit from his style. Armed with a raspy but mellifluous voice, the lively spirit of the disc is bolstered by a far-flung mix of songs. The life-long Hoboken artist surprises on the absolutely tender original "A Breeze Blows Through the Palm Tree," an acoustic song that stirs via his vocal performance and Marc Jonson's subliminal organ. He mines similarly affecting emotional territory on a version of the George Jones hit "I Always Get Lucky with You." Uptempo standouts include his Cajun-flavored title track, the old time rock 'n' roll-styled "Let's Make a Deal - Marriage Proposal" and a New Orleans-flavored cover of the Chris Kenner & Allen Tousaint 1961 classic "I Like It Like That". Information: bar-none.com. Tell me more: Lovers of traditional blues will love the new collaboration featuring award-winning vocalist and harmonica virtuoso Curtis Salgado and guitar great Alan Hager. On the duo's newly-released Rough Cut they explore the genre with a mix of potent originals and beloved covers. Among the great tracks on the set are the driving originals "So Near to Nowhere," "One Night Only" and warmhearted acoustic track "I Want My Dog to Live Longer (The Greatest Wish)." 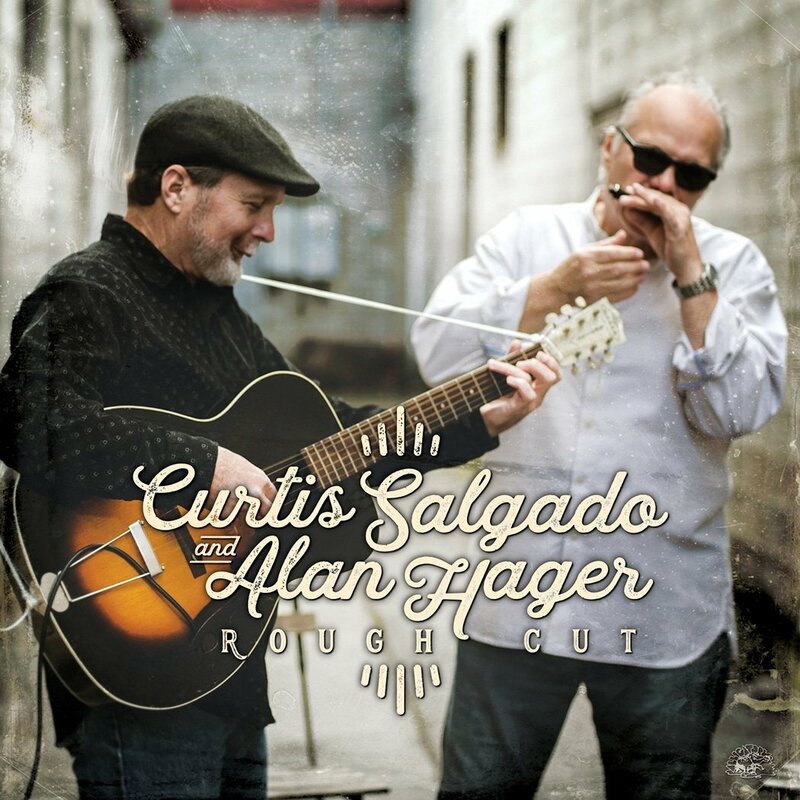 The two artists also take on a number of well-known classics, with the buoyant Muddy Waters standard "I Can't Be Satisfied" (featuring some sly slide work from Hager), biting Chicago blues nugget "Too Young to Die," a wonderfully vocals-anchored "Morning Train" and dance-minded take of Elmore James' "You Got to Move" among the essentials featured on the 13-track disc. Information: alligator.com. 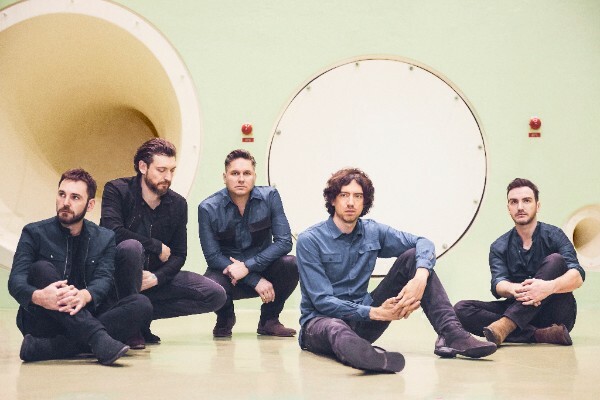 So good to see Snow Patrol returning with new music and getting out on the road again!